It’s hard to believe that our sweet Adeline is five. 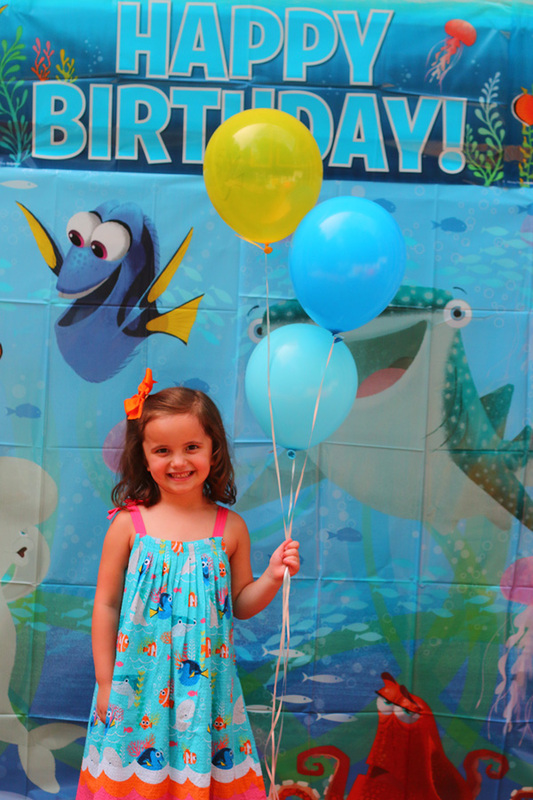 We have been planning to have a Finding Dory party since November when we learned the movie was coming out the week of her birthday. Little did we know I would go to the premiere and meet Ellen just weeks before the party! 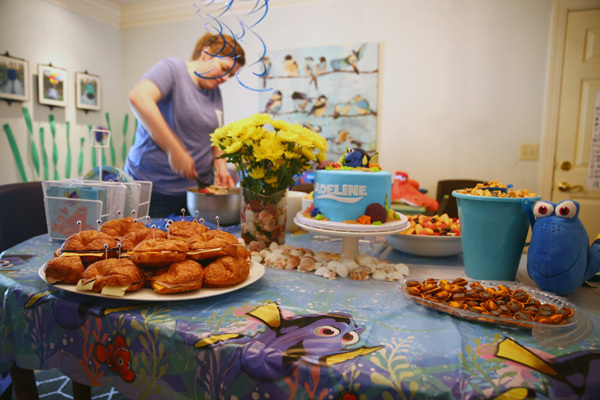 The Finding Dory party came together perfectly and I have SO much to share about it. 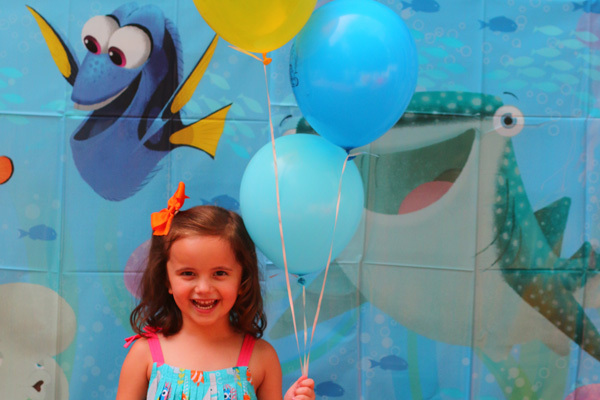 Finding Dory is the hit movie of summer, and I imagine lots of kids are going to be having Finding Dory parties in the coming months. I hope this post provides lots of information and resources. 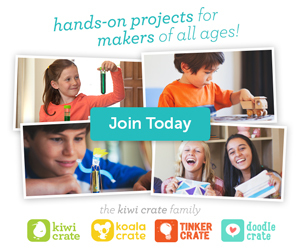 There is a separate, more in-depth post on the crafts. I found a Finding Dory invitation design on Etsy and had them printed on Shutterfly. Adeline looked so cute hugging Dory. 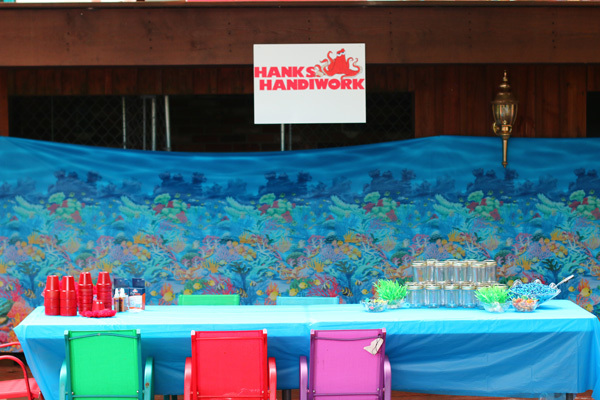 Most of the time was spent outside, so I kept the interior decorations very simple, with a Finding Dory tablecloth (similar version here) on the table. For the center of the table, I filled a vase with shells and yellow flowers and had the Finding Dory cake on a cake stand. I found bags of seashells at The Dollar Store, so they were a very affordable decoration!. I also taped here up in an empty corner to look like seaweed. 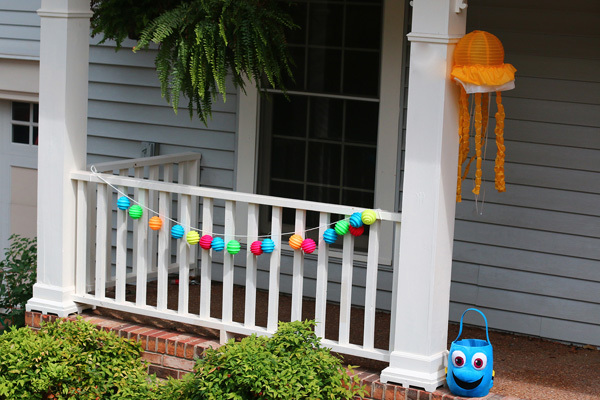 Finding Dory hanging decorations added additional character fun in the room. 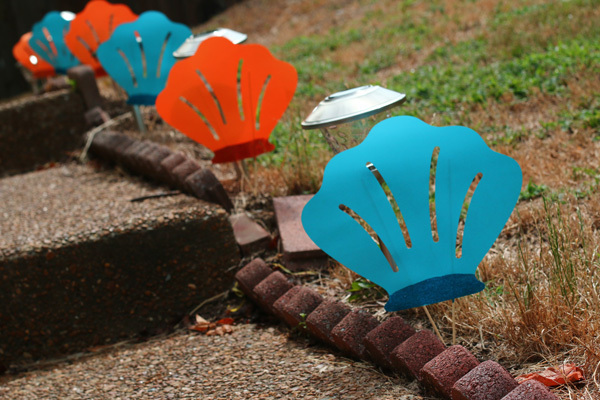 I cut seashells out using my Cricut and attached them to skewers for the path to the front door. (Remember how shells showed Dory the way home?) These came together super quickly and were so adorable. 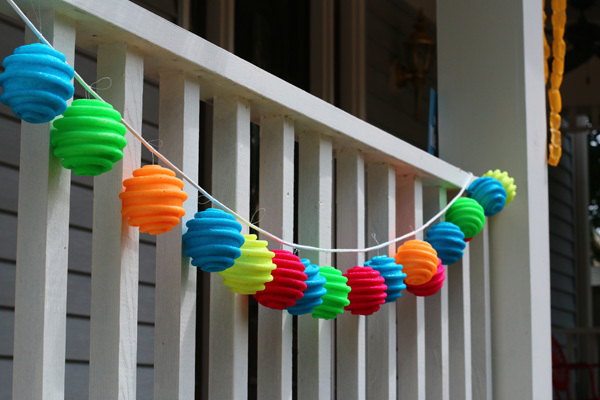 I used Christmas ornaments that I bought at Target 90% off to make garlands for the front porch. They added a fun pop of color and whimsy to the front yard. 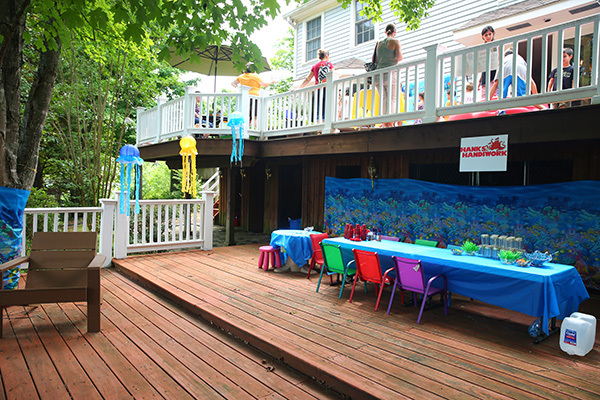 The bulk of the Finding Dory party took place on the deck, so that is where most of the decorations were. 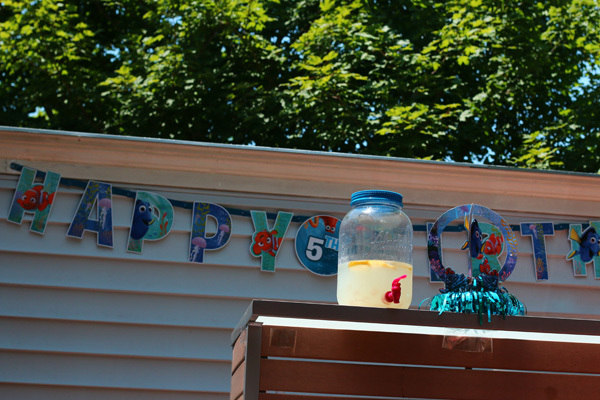 We had a Finding Dory Happy Birthday banner up behind the bar. (I couldn’t believe the size and quality of this banner and loved that the age could be customized). Next to the lemonade we had a cute Finding Dory table decoration. I bought a coral reef backdrop and used it as a backdrop for our lower deck. This backdrop was 40′ so could be used in several spots. There was enough to wrap the trees and cover the bar too. It would also work well if you were having an indoor party. It added SO much to the party decorations. 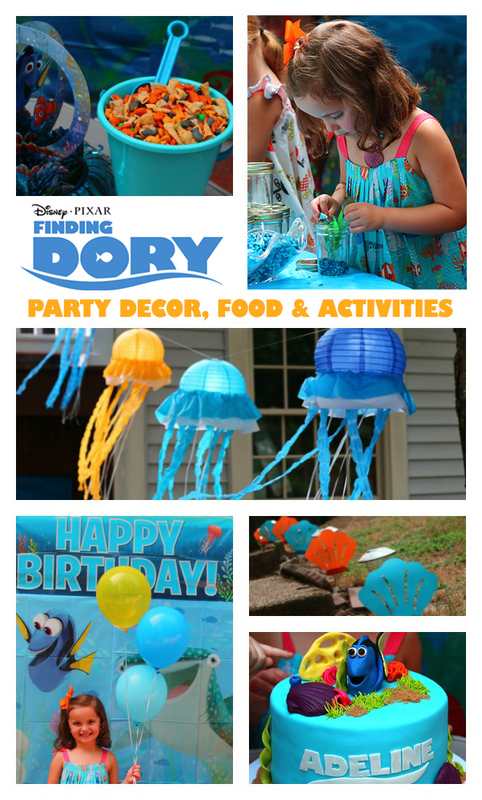 The stars of my Finding Dory party decorations were definitely the blue and yellow jellyfish. I made them using paper lanterns (I found them on clearance at Target 3 for 50 cents!) + tablecloths and ribbon. They were time consuming, but I did them over the course of a week, which made it not so bad. They added SO much to the decorations, and I was really happy I made them. I will say, there was a big difference in the quality of the tablecloths I used. I paid $1.99 for the yellow and light blue tablecloths at a party store and bought the dark blue at the Dollar Store. The Dollar Store cloth was much more flimsy and harder to work with. 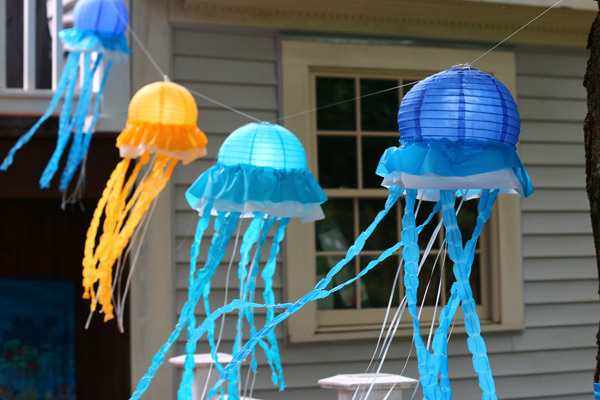 You can make many jellyfish from a single tablecloth! I loosely followed this tutorial, but modified it in that I did not cut the lanterns. Ezra was NOT into taking a family photo. The Finding Dory party was right during his nap time, sweet baby! I got Elias and Adeline’s Finding Dory clothes at The Disney Store , and Ezra’s shirt at Target. 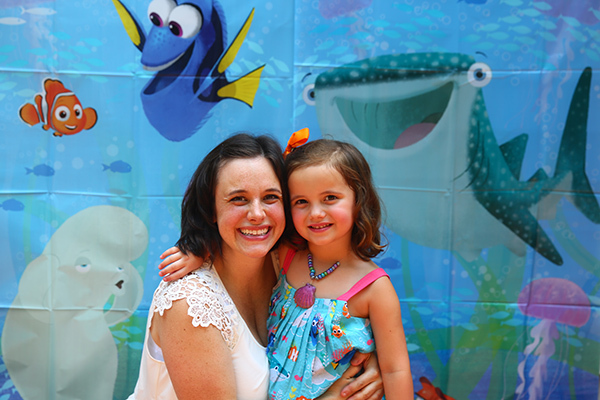 Using the Finding Dory photo scene setter as a backdrop, the kids took lots of photos together. We had silly glasses and goggles for the kids too. 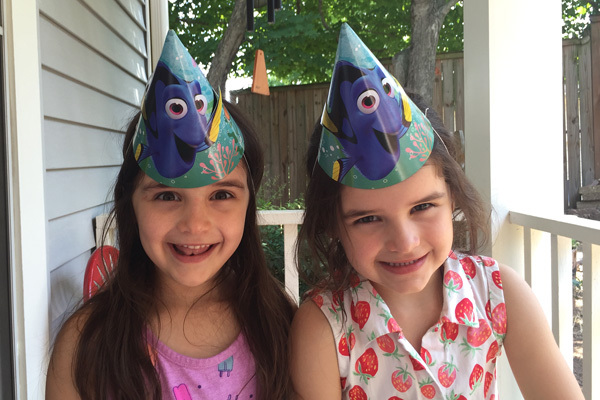 As you can see, the kids all got Finding Dory tattoos (found some in the Target dollar spot) and made name tags with Finding Dory stickers (also found in the Target Dollar spot) when they arrived. 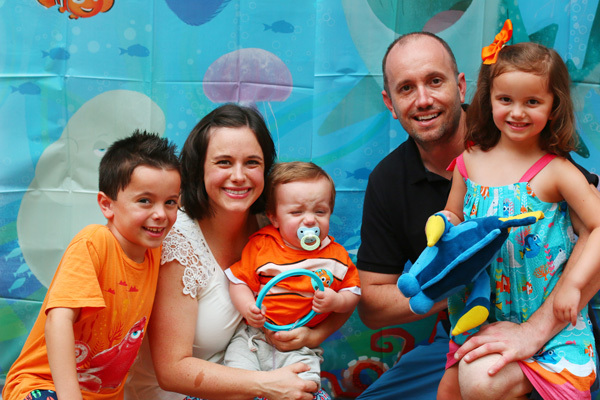 I am a HUGE fan of photo spots for birthday parties. I think they encourage great group photos. I always maximize the spot by moving a kids table to the spot when its time to eat to get cute shots of the meal + cake. It also works great for doing presents there. 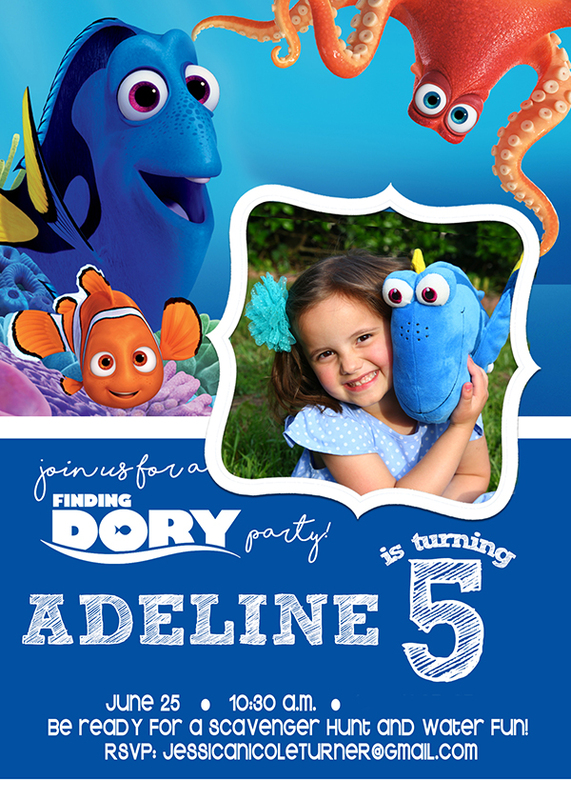 Adeline loves to craft, so I came up with three simple Finding Dory party crafts. I called the craft area “Hank’s Handiwork” and made a little sign to hang over it. 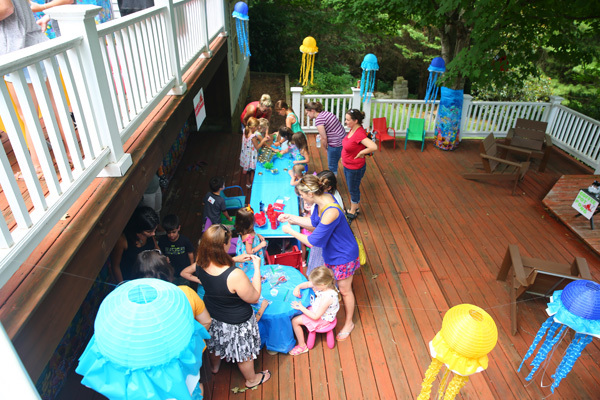 I had two long folding tables (I love these adjustable ones – best party investment I ever made. Well worth $30 each) + an additional child’s table for the crafts. The tables were covered in blue tablecloths from The Dollar Store, which made clean up easy. Seashell necklaces: Because seashells play such an important part in Dory finding her way home and to her parents, the girls made seashell beaded necklaces. I ordered purple shells from Etsy because purple shells were Dory’s mom’s favorite and bought pony beads and string at a local store. 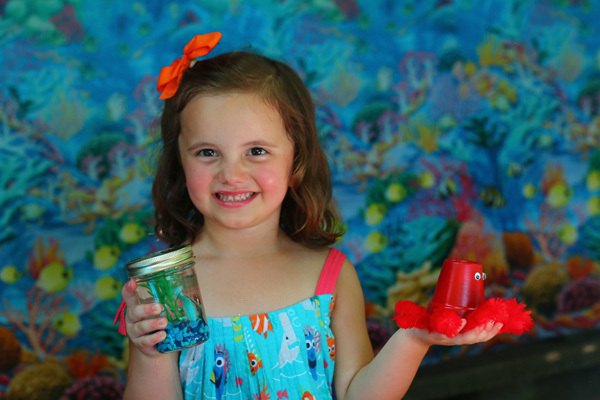 Aquariums: The children each made mini aquariums, like the open ocean exhibit that Dory’s family lived in. 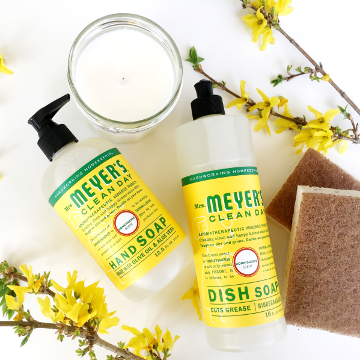 Supplies included 8 oz. mason jars, distilled water, aquarium gravel (after the party I found that The Dollar Store carries this, though not in the pretty blue color), ocean creatures and some fake plant life. Hank the septopus: They also made a septopus like Hank using red terra cotta pots, googly eyes and big fuzzy pipe cleaners (bought at Michaels) that were attached with glue dots. 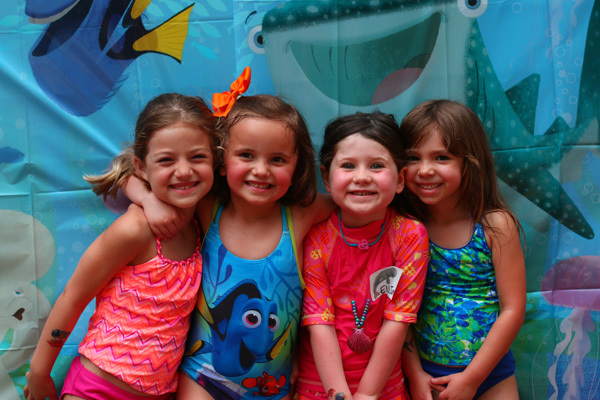 In addition to the crafts, the kids had fun playing in the Finding Dory sprinkler and Finding Dory splash pool. 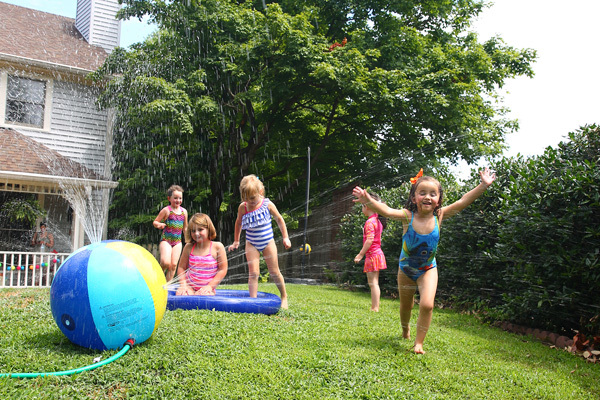 I would not recommend buying this sprinkler for a bunch of rambunctious kids because it broke within 30 minutes because the kids were pushing on it to get the water to spray in different directions. We also had a Coffee Pot Pong game on the deck using four glass coffee pots and some ping pong balls. I made the signs using my Cricut and adhering the letters with my Xyron. I loved how the signs turned out and thought they added a lot to the decorations. 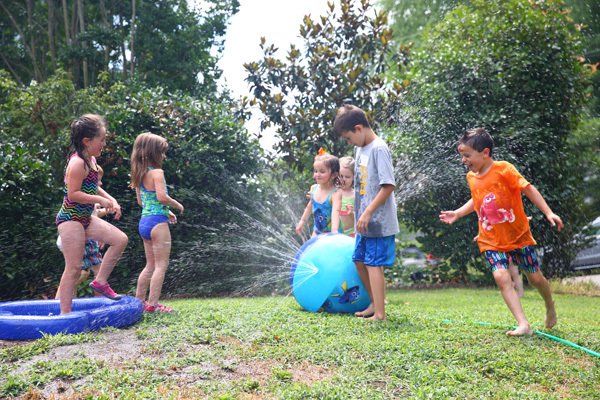 We had plans to do some other Finding Dory yard games with the Hank ring toss (no longer available), but the kids spent so much time in the sprinkler there wasn’t time. After lunch everyone enjoyed the vanilla Finding Dory birthday cake. 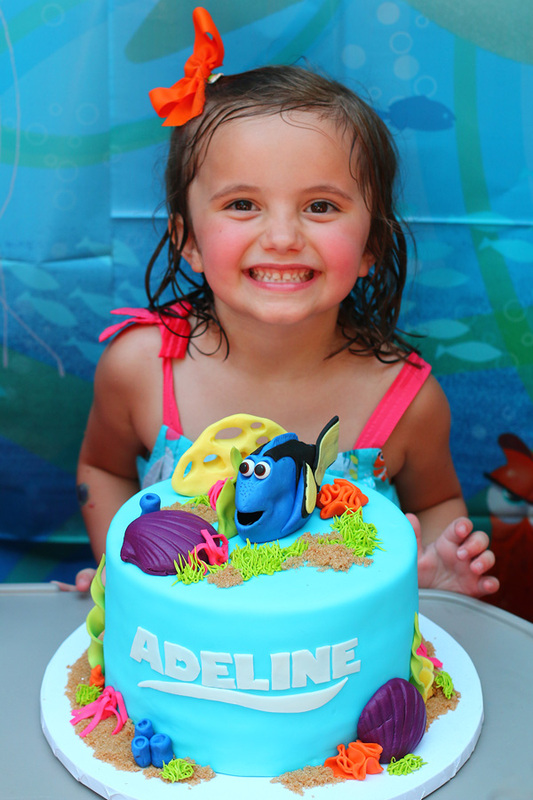 Adeline squealed when she saw her name written on the side “just like Dory”. 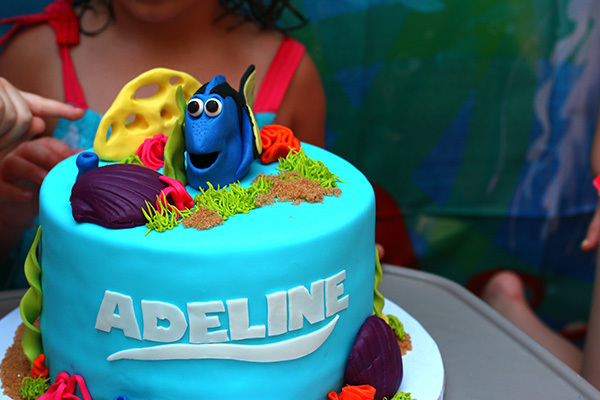 The cake designer also incorporated purple shells and kept Dory the star of the cake. 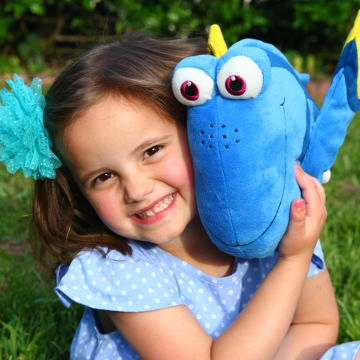 Everyone loved the design and couldn’t believe how perfect Dory was. 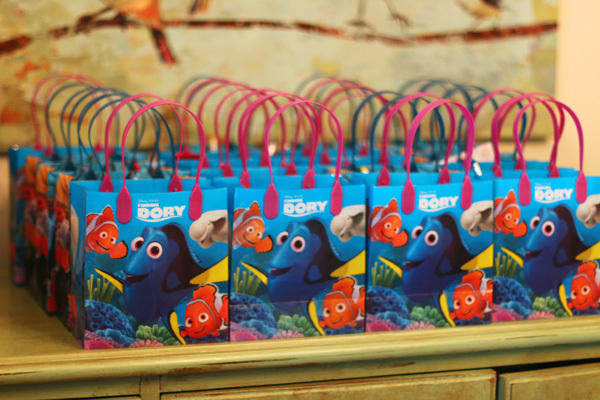 I found these adorable Finding Dory party bags on Amazon and loved them so much more than the typical little grab bags made for favors. They were made of a really nice sturdy plastic material. Inside I put crayons (bought 70% off at Target), Finding Dory bubbles, Finding Dory pencils (6 for $1 at Target), and Finding Dory fruit snacks. They were a lovely little thank you for coming to the party. 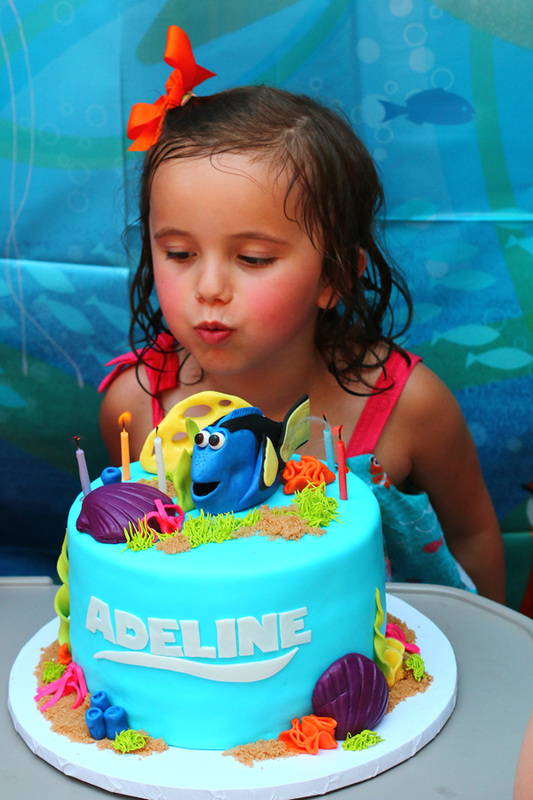 All in all it was an extremely fun and memorable birthday party for Adeline. My friend Angie said it was her favorite party I’ve ever thrown (and she has been to them all!). I loved coming up with everything and making all the decorations. I hope someday when my kids look back on their birthdays, they will remember all the love their mommy poured into the parties to celebrate their lives. 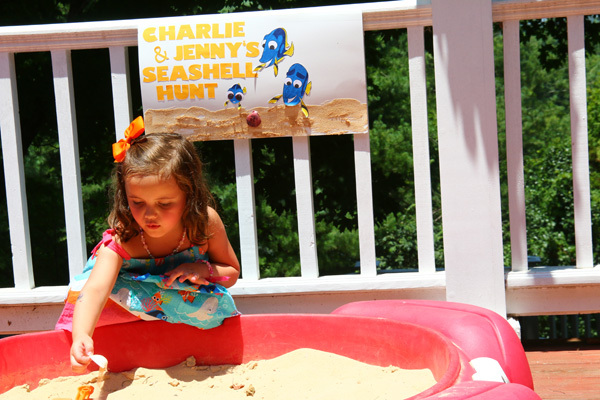 If you love throwing parties, please pin this party on Pinterest! Who manned the photo area?? I love the idea of a photo spot but think I would be so distracted with other things that I wouldn’t remember to snap pictures!! Also what has been your standard when it comes to parents staying/leaving? 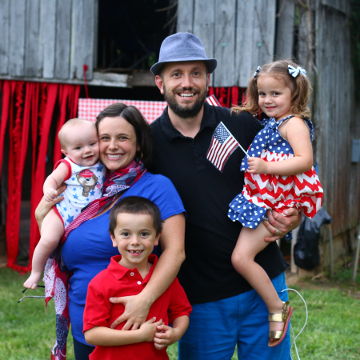 I have had a few parties and typically the parents just drop off the kids…but in your pics it looks like a lot of the parents stayed. Do you communicate that in advance? And finally how long do you run your party usually?? Looks like a great party! There was no “manning” of the photo area. 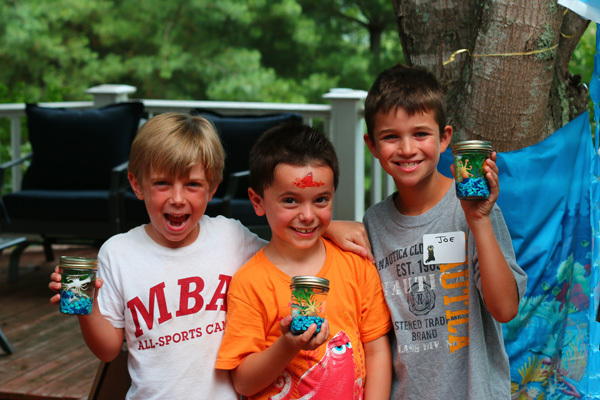 I usually take photos before the party starts, and then whenever there is a group of kids around, I say smile! 🙂 My camera never leaves my shoulder, so that helps. As for parents staying/leaving, parents generally stay at our parties. I noticed that the leaving trend tends to happen when the kids are a little older (7ish), at least for the parties my son has gone to. Elias is turning 8 next month and we put on the invitation that the parents could leave and plan to pick up at a certain time. You are an amazing inspiration and I know your children will definitely look back and see how much their Mom (and Dad) loved them so. 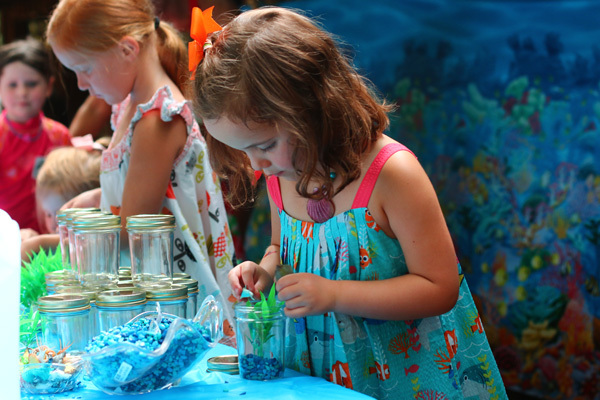 Can’t wait to read more about this incredible Finding Dory party! You are so very kind. Yes, it is hard to part with the handmade stuff. I still have the Sesame Street characters that I painted for Adeline’s birthday when she was 2. Most of the stuff (like the signs) I get rid of. I did keep the jellyfish, since they store flat. 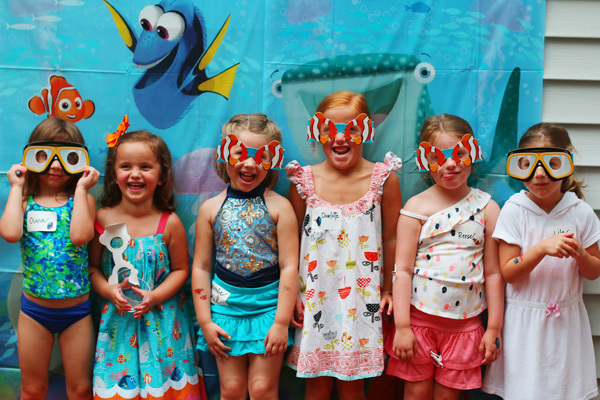 I figure a mermaid, Octonauts or under the sea party may happen at some point. 🙂 I am fortunate to have a large storage room off our garage and two shelves in it are dedicated to party supplies. Everything is in rubbermaid totes and labeled. This party is just the cutest! I love all of the small details and how much time that you put into this. Your kiddos are SO lucky to have a creative and awesome mom like you!!! This party is so amazing Jess! 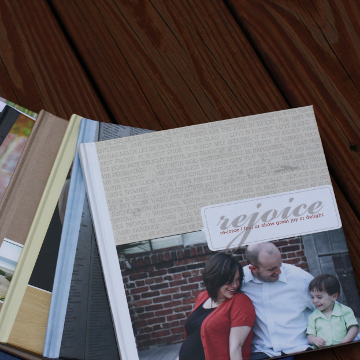 I’ve been waiting for the post about it – so fun to get a sneak peek. 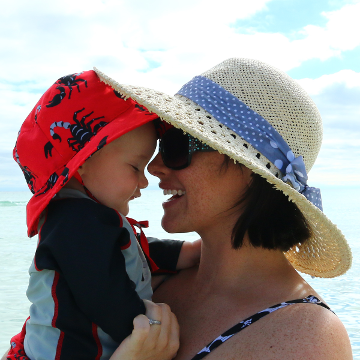 You’re so talented friend and I love watching how you love on your kiddos! Wish we could have been there! Hi, congratulations on hosting such a wonderful party. i loved all the nitty gritty details. I am new to this throwing party at home and hand crafted stuff. Your page definitely inspired me. My son is turning 4 this August and loves Dory. 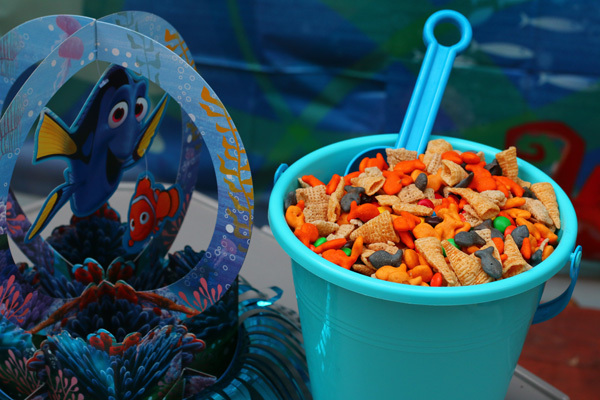 Will it be weird to host a dory themed pool party in August and that too for a boy? I don’t think it is weird at all, especially since most of the main characters in Finding Dory are boys. My son especially LOVES Hank and Bailey. 🙂 A lot of the decor has Hank on it too. Hope this helps. This is great! I’m doing g a dory party I a week so this is so inspirational! I’d like to know more about the finding dory pasta and the other snacks you provided. Beside the fruit salad and the crab sandwiches. 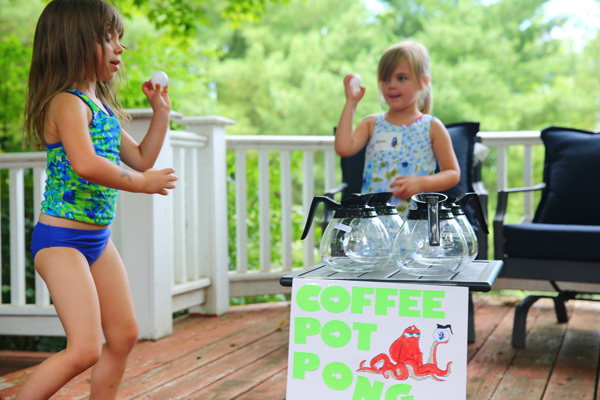 Also where did you purchase 4 coffee pots I love your coffee pong idea but I don’t want to spend $10 /each on a coffee pot for a one time thing…. Thoughts? Thanks so much for posting this love love love it!!!! I found the pots at a restaurant supply store. The pasta was just Kraft Mac & Cheese noodles and I used a Food Network pasta salad recipe. I’m working on a post about all the food because it is SO much and way too much to leave in a comment. 🙂 Good luck with your party! That party looks awesome and it looks like everybody had a great time! The party looks like it was so much fun! What a fun party! The cake is so adorable! Pinning this to our party board! This party idea is awesome! 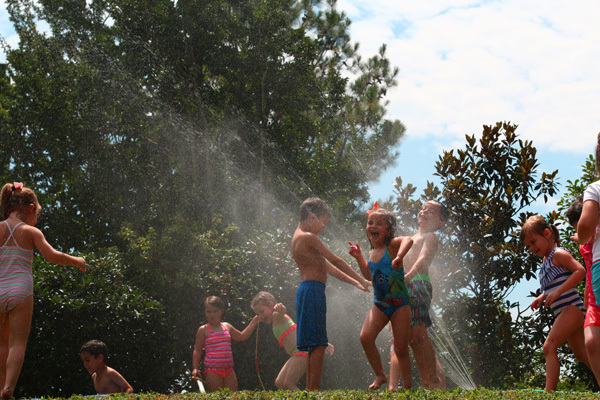 The kids have so much fun too! This party is AMAZING! It seriously makes me want to have a Finding Dory party for my 30-something year old self later this summer! GREAT ideas. Congrats on a beautiful and fun party. The colors are so vivid as are your pictures. Great job! WOW! This party is incredible! Maybe by the time my daughter is 5 I’ll be as creative and ambitious as you are! SO CUTE! What a sweet birthday party. Time does fly by. Before you know your little Adeline will be all grown up. You provided such a fun party. Loving the details and accessories. colorful and fun. Your Adeline is a cutie. Thanks for sharing this lovely birthday party at DI&DI. Cake decoration looks super cool. Could you share the Cake bakery contact details please?? I love party ideas! 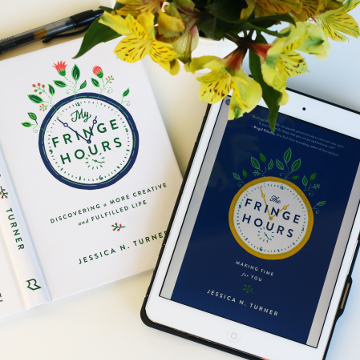 This is such a great one, with so many ideas shared. Pinning! Thank you so much for sharing your posts with us this week at Brag About It! What image on Cricut did you use for the seashells? I’m sorry, I don’t remember!